We’re Smokin’! 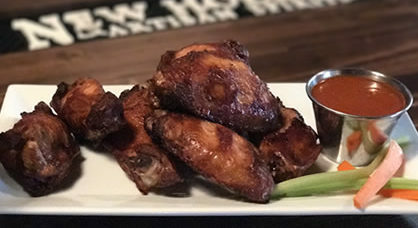 Order our wings and you will be graced with 8 of our infamous, fall-off-tha-bone chicken wings – smoked right here at CBB. They’re served with house-made ranch for dipping. You can try em’ with one of our in-house made sauces or simply naked. The sauces you can choose from are Buffalo, BBQ, Hot BBQ, Teriyaki or Creek Bottom Burner Sauce. Who-hoo they’re dang good!